Beloved brothers and sisters: since these our sons, who are your relatives and friends, are now to be advanced to the Order of Deacons, consider carefully the nature of the rank in the Church to which they are about to be raised. 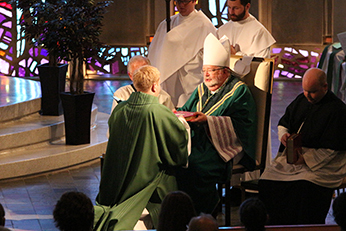 Strengthened by the gift of the Holy Spirit, they will help the Bishop and his Priests in the ministry of the word, of the altar, and of charity, showing themselves to be servants to all. As ministers of the altar, they will proclaim the Gospel, prepare the Sacrifice, and distribute the Lord's Body and Blood to the faithful. Furthermore, it will be their duty, at the Bishop's direction, to exhort believers and unbelievers alike and to instruct them in holy doctrine. They will preside over public prayer, administer Baptism, assist at and bless Marriages, bring Viaticum to the dying, and conduct funeral rites. 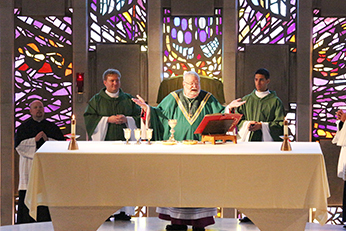 At the Mass of the Rite of Ordination to the Diaconate this past weekend, Bishop Daniel Jenky shared this text from the Exhortation in the Roman Pontifical. Rev. Mr. Matthew Hovde, C.S.C. and Rev. Mr. Dennis Strach, C.S.C. 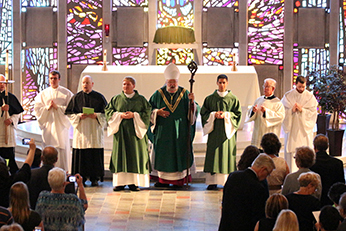 were both ordained to the Order of the Diaconate on Sunday, August 30, 2015. 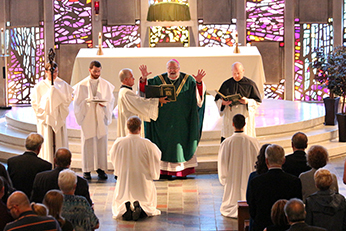 Their Priestly Ordination is planned for the spring of 2016. 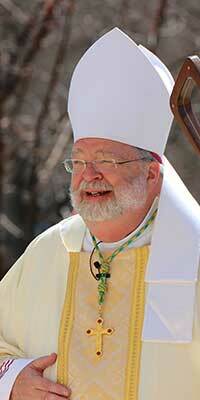 Bishop Jenky currently serves as Bishop of the Diocese of Peoria in Illinois.